ARLINGTON, VA, October 19, 2015 /3BL Media/ – Around the world, 884 million people lack access to safe drinking water, and 2.6 billion have inadequate sanitation. Every 20 seconds, a child dies of preventable water-borne disease. These water-related challenges stunt international development and economic growth around the world. In response, Know Obstacles, Global Water Challenge and H2O for Life are teaming up to bring awareness of these challenges. 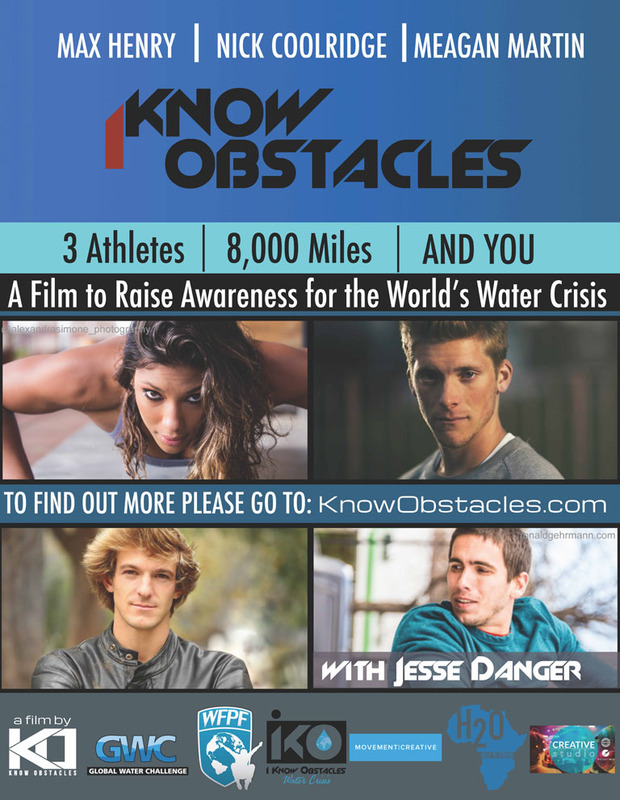 To do so, American Ninja Warrior finalists Nick Coolridge and Meagan Martin and parkour athletes Max Henry and Jesse Danger will work with Know Obstacles to crowdsource funds for a film entitled iKnowObstacles: Water Crisis. The film will follow the athletes as they journey halfway across the globe to Africa to experience firsthand what it means to live where the world's water and sanitation crisis is a daily challenge. While in South Africa, the athletes will visit two elementary schools to learn from the faculty and children about the trials they face daily regarding access to clean drinking water and sanitation, and the obstacles they’ve learned to overcome. To support the development of the film, Know Obstacles is launching a crowdfunding campaign on RocketHub.com where participants can make a contribution in exchange for a thank-you gift, ranging from shoes to production credits in the final film. The campaign launches on October 19, 2015 and will run until November 18, 2015. Supporters will have the opportunity to be included in the film. Parkour is an athletic discipline and fitness movement through which practitioners train to get around, over, or through obstacles in the quickest and most efficient manner possible, often by jumping, climbing, vaulting, or running. Parkour has been widely dubbed as the “sport of the YouTube Generation” due to its viral popularity through online videos of athletes overcoming obstacles in urban and natural environments. Parkour is taught as a physical discipline and lifestyle in gymnastics and parkour facilities around the world. While filming in South Africa, the athletes will engage with local schools and teach parkour fundamentals. When the athletes return to the U.S., they will share their experiences with American school children and encourage them to set up their own fundraisers for clean water access projects through partner H2O for Life, an organization that encourages American students to raise awareness for the water crisis. “The goal of the project is to leave behind a sustainable legacy of creativity, physical fitness, camaraderie, and optimism that will assist educators as they teach life skills that will help children give back to their communities and future generations,” says Francis Lyons, a producer of the film. Founded in 2006, Global Water Challenge (GWC) is a nonprofit 501(c)(3) coalition of leading organizations committed to universal access to clean water and sanitation. Drawing upon the expertise and assets of its members, GWC is able to create partnerships that achieve far greater results than any one organization could by itself. Global Water Challenge’s donor membership includes The Coca-Cola Company, The Dow Chemical Company, The Ford Motor Company, Cargill and Wallace Genetic Foundation. Its network of nearly thirty implementing organizations represents best in class partners and a global reach. Learn more at www.globalwaterchallenge.org. H2O for Life educates, engages and inspires youth to learn, take action and become global citizens. We provide students with a unique and valuable learning experience through service-learning opportunities focused on the global water crisis. H2O for Life gives schools, youth groups, and faith-based organizations the opportunity to raise awareness about the water crisis while taking action to provide funds for water, sanitation and hygiene education for a partner school in a developing country. H2O for Life will provide teaching materials for the iKO: Water Crisis team when they visit schools in the United States. Learn more at www.h2oforlifeschools.org.